Our Finest Knitwear, which we created earlier this year, is back in a second batch with a new colour. Alongside the navy fine-merino knitwear - in crewneck and V-neck - there is now also a dark, muted green that I picked for its versatility. Both are available on the Shop, separated into the two neck styles. 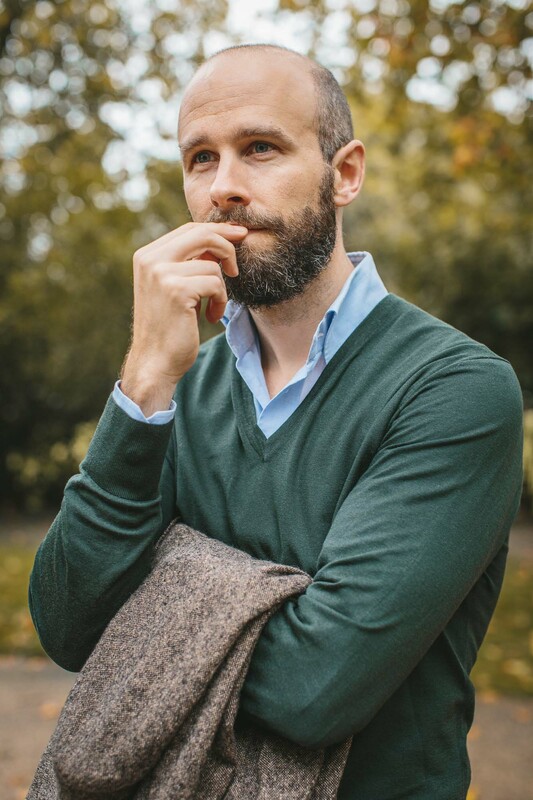 For me, green sweaters have a tendency to be too strong in colour - which can look great online, but is harder to combine with a range of other colours in an outfit. When I picked the second colour for our Finest Knitwear, therefore, I went for the most subdued merino from the Loro Piana range. Those sample books are a riot of colour, from sugary pinks to rich, deep purples. But most of them would dominate an outfit, and in my experience are bought with much excitement and then rarely worn. This muted green works well with both country colours like brown and tan, and city ones like grey and navy. It also avoids looking too rural and countrified - toning down rather than livening up. I have pictured it with brown and navy pieces to illustrate this point - both of which themselves ride that borderline between cold, urban formal and warm, country casual. 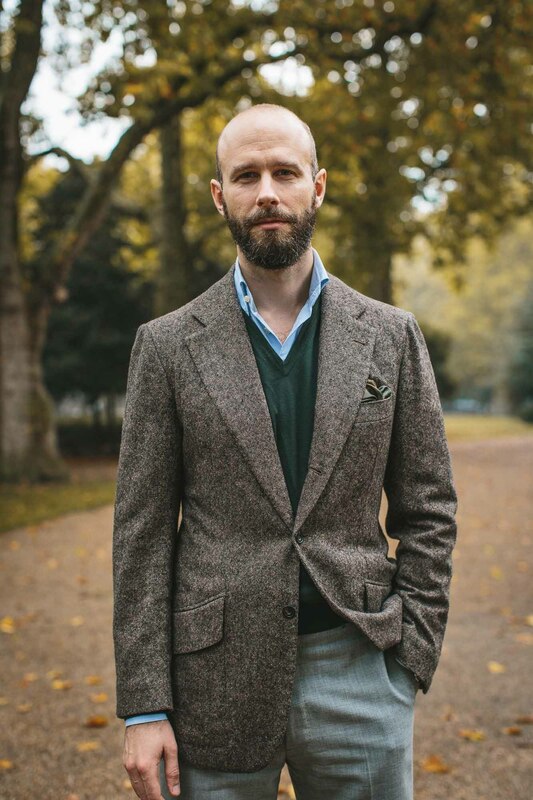 The jacket from Rubinacci is a brown donegal cashmere but incorporates both black and grey. And the topcoat, from Ettore de Cesare, also has black in the weave. For those unfamiliar with the Finest Knitwear and the philosophy behind it, please read the original post here. One recommendation I would make to readers is to fold the knitwear carefully after use, and not pull it on too violently. It is not particularly delicate, but finer things necessarily require greater care, and folding also avoids any creases. The knitwear costs £190, and is available now on the Permanent Style shop. They will be shipped out from the UK from Monday onwards. Readers on the waiting list were alerted this past Monday, and some stock has therefore already gone. You can follow the discussion on Finest Knitwear available again – in navy and green by entering your email address in the box below. You will then receive an email every time a new comment is added. These will also contain a link to a page where you can stop the alerts, and remove all of your related data from the site. First of all I would like to thank you for your great work. Secondly I would like to ask you a question regarding the difference in fit between a Luca Avitabile polo and a Luca Faloni polo. Is there by your experience any noticeable difference or are they sized pretty equally? I’m asking because I find the Luca Faloni polo in medium sits a bit too tight across my shoulders/armpits. Are your trousers very low in the rise? Your coat seems buttoned very high up your torso. agree with previous poster. looks like its on your sternum. too high by far. It’s not. About an inch and a half above my belly button, on my natural waist. Kristofer, I have a size Large in both the Faloni and Avitabile polos. The Faloni is slightly larger in the chest though not markedly so. Love both of them. Hi. I own both and I size up one size on the LF. They are very fitted and tight by comparison in the same size. Hi Simon, I was so impressed with the shirts that I bought 2 ! I’m a 44 inch chest – will an XL v neck in the finest knitwear fit ok ? 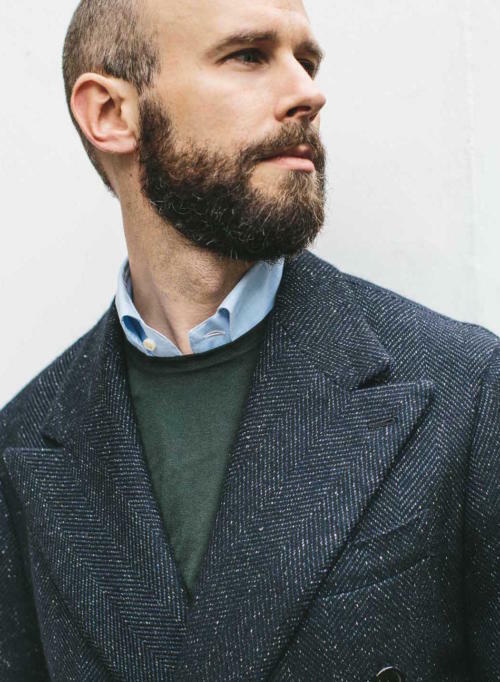 Interesting that you are wearing Crispaire, a summer cloth, with tweed. What are your thoughts / reasoning for this? I’ve considered wear LL «fresco» cloth with tweed on occassion but had assumed it wouldn’t work. So excited for this and have already put in an order for the v-neck. I currently have the navy one in a crew neck and the quality is spectacular. I’ve also found it’s particularly useful for travel; being so light, it fits easily in my carry-on to keep me warm on the flight, and can also be worn under a jacket, or on it’s own in the evening to make three variations on one outfit. Have you found these knits to also pair well with more casual wear (i.e. denim) or does the long ribbing make for an odd pairing? I know that the knits were originally conceived to be worn with tailoring but, given the small runs, I wasn’t able to find any shots of readers wearing these ‘in the wild’ and was curious of your experience. A cashmere from Luca …………..instead of denim……………..tsk.!! Does he offer cashmere trousers? Who makes trousers from cashmere……..???? Of course it would be perfect with denim………..
Related but a little off topic. What do you think of Fair Isle pullovers (with sleeves and sleeveless)? Do the many colours make it harder or more difficult to wear with jackets? Simon what do you mean by cashmere ‘doesn’t wear well’? Do you mean in terms of temperature or that it suffers a lot of wear and tear due to delicacy? I very much appreciate that you’ve picked green as a new colour. A green sweater has been a gap in my wardrobe that I’ve struggled to fill. So getting something of this quality will hopefully be a fitting end to my search! a question to another Topic. I looked through your page and I wasn’t able the find your Schiesser Report for the “Underwear Project”. Did I overlook something or is this still on your list? No, I never did Schiesser in the end. Could you give me a short comment on their quality? Great quality, certainly, but the biggest issue with these traditional makers is design – cuts that are definitely underwear for T-shirts, or odd for other underwear. And that I’ve never tried. I really enjoy following you and reading your articles. I was wondering if you have any advice on an article/book about wool fabrics. I would love to learn more about different versions (geelong, shetland, merino etc.) and their characteristics. Any suggestion is more than welcome. Mayen you already think about writing something. Hi Pascal. Thank you. There is a lot of very technical detail in our Guide to Cloth section – see the ‘Cloth’ link in the nav bar above. Have you ever reviewed these Solito trousers and are you planning to? Would be good to have your views on them, as well as how they stack up again the likes of Cerrato, Ambrosi etc. I haven’t, but I can, yes. In general, I would say that they are similar to my jackets: good fit, not great finishing and therefore not comparable to Cerrato etc, but good value. It sounds like it might be worth you trying an XL, but obviously it depends a lot on your other measurements. It sounds like you have compared the measurements to a sweater you already have, is that right? I did measure a couple of my sweaters that are a bit of a chunkier cashmere and are more on the casual side. Their chest measurements are 55 and 56, even if they are a medium. A finer Merino V neck that I have that is closer to what you have has the chest measurement fall between medium and large. May I ask, as a reference, what your suit size is and what size in the finest knitwear you wear? Well, I don’t really wear RTW suits, but I’m roughly a 39 inch chest, and I wear a medium. But I also like knitwear like this to fit a little snug, and I’m slim so I want it fairly fitted in the waist. Thanks Simon. Appreciate the information. I’m about a 42 and not slim (not rotund but not slim) so an L, maybe, for a tailored fit. I received the green v neck a few days ago, and am very pleased with it. The large fit quite well. Fitted but not too snug. And the colour was just what I was looking for; it was a bit darker than in the photos, which was perfectly alright with me. It is a very fine wool and I did notice how the subtle differences that you mentioned, the length of the V, the longer ribbing, made the sweater even more elegant. I’m very happy with it. Now, if you could also bring back the Friday polo in brown please, that would be fantastic! This is really a lovely knitwwear! Do you know what? I’ve read this post three times to make sure I’ve indeed read a real breakthrough in how the main features of such a key item in menswear should be depicted for style conscious guys! Hi Simon – I was napping and appear to have missed out on a Medium Green Crew. You mention a Waiting List in your piece. How does one get on to it? Is Loro Piana worth all the money they charge? Seeing their prices like £360 for a t-shirt and £415 for a pair of jeans makes me think they are totally overpriced. Are they trading on their name? I ask this because you’re using Loro Piana fabrics in your knitwear and charging pennies in comparison. I have the crewneck from last run, and received my order of both v-necks in the mail yesterday. The green is beautiful – and looks darker in real life (closest to the first picture, in my opinion), looks great on. Very rich, very wearable, and yet a little bit different from a classic navy. Thank you like always – home run, yet again. I’ve got the green one on now. It is nice. Proabably a bit like Escorial is to cashmere: almost as soft, but will wear better and is not as fragile. My kids have already tried their best to ruin it……. I received my first knitwear last week (V-Neck, Navy) and I was so happy with it that I ordered the same in Green and the crewneck in both colours the next day ! > There is a Drake pop up store in Paris in the three coming days, which I am going to attend, I already have ties from them and was wondering about the quality of their Knitwear, especially their cable knit, any intell on the quality ? Amazing, glad to hear it Ben. – The Drakes turtlenecks are really nice and well fitted, but there aren’t any new in for this season yet. Also Howlin ones at Trunk, which I did mention. – Large or Extra large, but I’d really recommend trying them on, as the fit is quite unusual. Large would be big enough in the body, but you might find it’s short in the body maybe. Any chance you will be producing these in a gray/charcoal? Will you be restocking the green V-neck in size small and medium? Simon – what are your thoughts on sleeve length when it comes to knitwear? I recently purchased a lovely V-neck from Luca Faloni. The fit is nearly perfect all around except for the sleeves which are a good 2-3 inches too long (essentially the length of the ribbed sleeve end). I could just fold them over but when spending this sort of money on knitwear it feels as though I’m perhaps compromising on fit. Do you worry about folding over, would you attempt to have the sleeves shortened (if such a thing were even possible)? Thanks Simon. It’s odd because I’ve never encountered this issue with knitwear before. Wondered if perhaps Faloni were known for a generous sleeve length but clearly not. Wondered if perhaps the Cashmere Care Service you’ve mentioned before might be an option to shorten the sleeves and if that would even be worth it? It’s worth asking them, although I’m not sure how difficult or expensive it would be. If you can’t find any other knitwear that is the right sleeve length, it might be worth it. 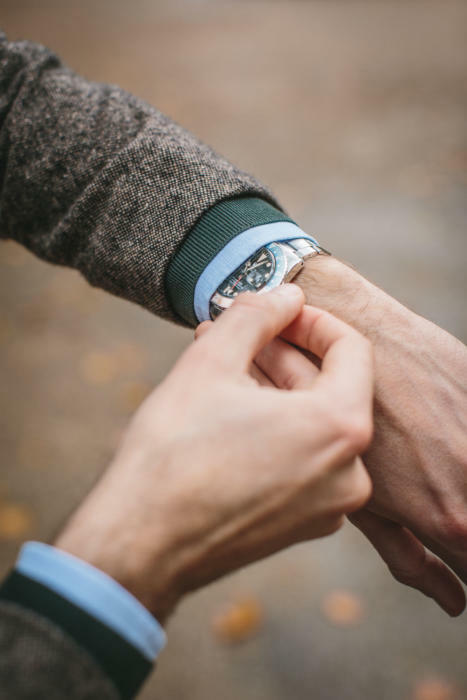 “We can request alterations are made to the sleeve length in our knitwear, but this can take a minimum of 4-5 weeks, as the adjustment would need to be made in Italy. For a one off alteration this would cost an estimated £40. Do you think it’s inappropriate to wear a T-shirt underneath a V-neck sweater? And what do you usually wear underneath a turtleneck? Well, having a V-neck sweater with nothing underneath is often unflattering unless you have a rather strong upper body and neck. And in either case can look a little greasy, as it suggests you might not be wearing anything underneath. A crewneck T-shirt is therefore better, but in general I wouldn’t wear this combination, no. I’d tend to wear a crewneck sweater with a T-shirt, or a V-neck sweater with a shirt. Do you own any V-neck T-shirts at all? I am now the proud owner of a green crew neck sweater. I think it is one of the most beautiful things in my closet and I wear it constantly! I didn’t realise how cotton can flow (almost silk like). 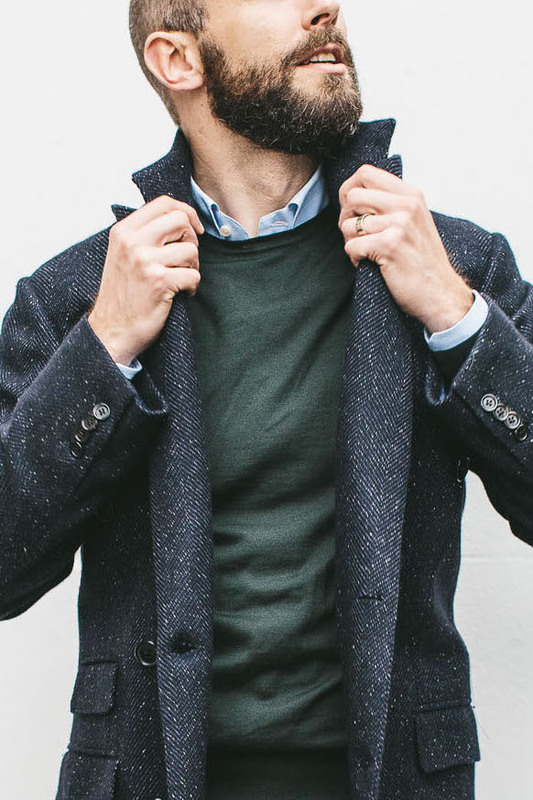 Now I want to invest in a navy v neck and I am considering sizing down from L to M. In this regard, does the sweater shrink when washed? That’s lovely to hear. I presume you meant merino rather than cotton? The sweater won’t shrink when washed if done carefully – on a handwash setting, cold, and then carefully dried on a rack. I would also suggest washing it inside a pillow case, to avoid stretching. I would advise only to wash it when absolutely necessary, however. One note to the delivery process. I rarely have seen such a smooth and fast delivery process (2 days!!). Usually this is a hassle when ordering from abroad and delivering to Switzerland! So concratulations on that! Simon! This is an amazing product. Really quite easily the nicest knitwear I have seen and owned. Which just goes to say: We need more colors! Thanks Thomas, so nice to hear! Focusing on getting navy and green back in stock for the moment, but then we’ll look to add more. I am looking for summer trousers, to be worn with a bespoke casual jacket in Cacciopoli fabric. It is a lovely one, with soft shoulders and patch pockets. Would you recommend me fresco trousers or crispaire? They will always be worn on weekends or holidays. There isn’t much difference between the two cloths, but personally I’d go for crispaire. Will there be a restock in navy medium any time soon? Are you planning to restock the knitwear? How would you compare the fit of these to a Smedley Bobby? Also, if I wear a Large in your Everyday Denim, would I wear a large in these? Thanks. Honestly a large in the Bobby is a little loose. The Luca Avitabile large shirt is right on.